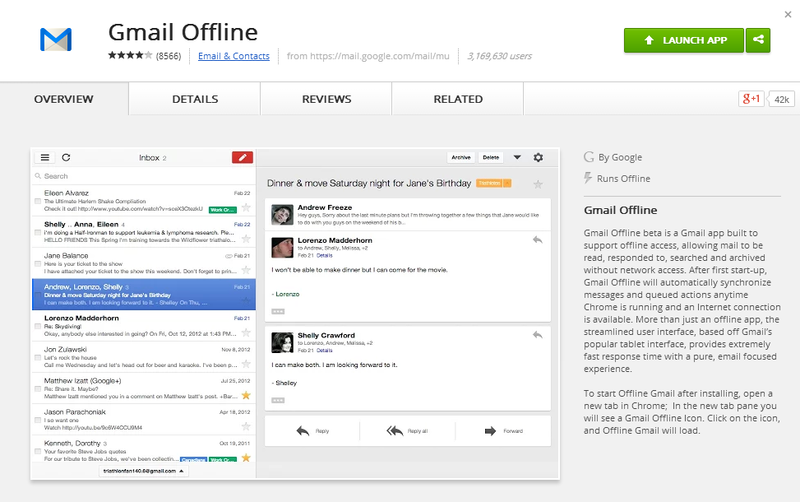 Recently Google has updated Gmail offline Chrome Web Store app. Gmail offline was introduced in mid of 2011. This was based on HTML5-powered app and it enables users to access their Gmail even when they are not online. New updates include a new settings page that lets you choose how many days of email you want synchronized for offline viewing. The new settings option lets you choose between 7, 14, or 31 days of emails. There is an update which has all the attachments and will now be downloaded so you’ll have access to them offline. These improvements include support for keyboard shortcuts. If you have keyboard shortcuts enabled in Gmail, your setting will transfer over to the Gmail offline app. If you’re not sure what you can do with keyboard shortcuts, try pressing ‘?’ next time you’re using Gmail or Offline. Some performance enhancements like Messages and attachments now download at a faster rate and some bugs have been fixed now. If you are already using Gmail offline, you’ll see these improvements the next time you open the app. Getting the best experience using Gmail offline, you need to make sure you are using the latest version of Chrome as some features may not work on older versions. So before using this app you should update the Chrome.